Lea, 1865, Proc. Acad. Nat. Sci. : 286 [as ‘Monocondylœa mardinensis’]. Lea, 1868, Jour. Acad. Nat. Sci. : 252, pl. 30, fig. 67 [as ‘Monocondylœa mardinensis’]. Type(s): FIGURED SYNTYPE USNM_86354, near Mardin, R. Tigris, Syria. + Leguminaia wheatleyi (Lea, 1862). — Graf & Cummings (2007: 309). *** NO OPINION *** — Falkner (1994: 148). + Leguminaia wheatleyi (Lea, 1862). — Schütt (1983: 56). = Leguminaia (s.s.) mardinensis (Lea, 1865). — Haas (1969: N424). + Leguminaia wheatleyi (Lea, 1862). — Haas (1969: 143). + Leguminaia wheatleyi (Lea, 1862). — Haas (1940: 133). = Leguminaia mardinensis Lea, 1864. — Pallary (1939: 114). = Leguminaia mardinensis (Lea). — Thiele (1934: 831). = Leguminaia (s.s.) mardinensis (Lea, 1865). — Simpson (1914: 445). = Leguminaia (s.s.) mardinensis (Lea, 1864). — Germain (1911: 66). = Leguminaia mardinensis Lea. — Kobelt (1904: 140). = Leguminaia (s.s.) mardinensis (Lea, 1865). — Simpson (1900: 651). = Leguminaia mardinensis (Lea, 1864). — Kobelt (1893: 92). = Leguminaia mardinensis. — Servain (1890: 295). = Leguminaia mardinensis (Lea). — Westerlund (1890: 188). 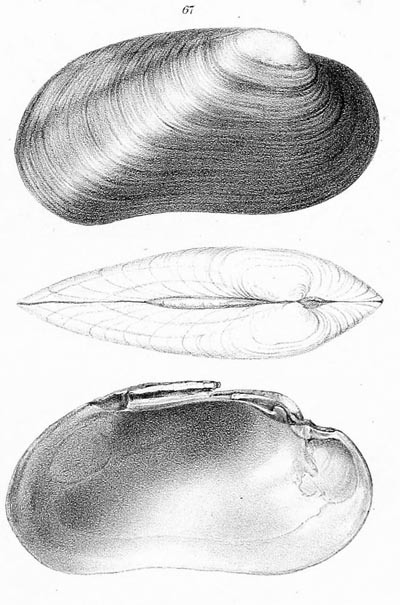 = Pseudodon (sec. Leguminaia) mardinensis (Lea). — Fischer (1886: 1002). = Leguminaia mardinensis Conrad. — Bourguignat (1883: 64). = Leguminaia mardinensis Lea. — Locard (1883: 250). = Leguminaia mardiniensis [sic]. — Bourguignat (1880: 3). = Leguminaia (s.s.) mardiniensis [sic]. — Bourguignat (1876: 98). = Margaron (Monocondylœa) [sic] mardinensis (Lea). — Lea (1870: 73). = Leguminaia mardinensis (Lea). — Conrad (1865: 233).